Come & visit our new and updated 2019 showroom in Cheshire, full workflow tutorials utilising our latest Digital Finishing Equipment including the complete Gemini Guillotine range, both the EB500 & EB800 models, the new Multi-Lam laminating solutions as well as the new Lami Corporation Auto Laminating Systems. Our Gemini paper guillotines are available from 490 mm to 670 mm cut widths. All models come complete with an intuitive Colour Touch screen with 4 program modes with larger models also incorporating adjustable hydraulic clamps for perfect results on all stock types. Our Ideal paper guillotines are available from 430 mm to 720 mm cut widths. Our latest range have the new 180 mm touch screen displays with digital models also incorporating adjustable hydraulic clamps for perfect results on all stock types. An Exclusive range of Automated Laminating machines and Shape Cutting machinery from Japan. Two machine options with smaller Revo Office designed for the School, College or Corporate Reprographics Room & the larger Auto Atlas 14T with Lami Cutter for bespoke designs within a Print Environment. 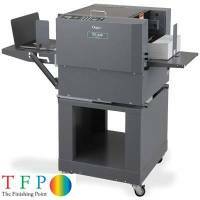 A new format of Perfect Binding Machines specifically designed to partner both traditional and digital print without the need for PUR. Specially designed & calibrated for use with the latest Digital Adhesives from Planamelt. Planax Copy Binder Thermal Tape Binding at its Best! We are the UK exclusive agent for Planax, stocking the latest CopyBinder 5, Copy Jogger and the matching consumables. The CopyBinder brings binding in to the 21st Century, bind from 5 to 330 sheets in under 20 seconds, no punching, no book building just instant and secure binding at the touch of a button. Multi-Lam Laminating & Foiling Laminate, Foil & Encapsulate on one machine! The Gemini ML350 Foil FX models are the only desktop format laminators to offer both single and double side laminating, the latest foiling techniques and encapsulation at the touch of a button! The new Gemini AutoCard range of high speed business card cutters offer an easy to use, compact desktop solution for both A4 and SRA3 formats. Touch screen LCD Controls & self sharpening tools ensure trouble free ownership. We are the main UK Sales and Service Agent for GMP UK offering their full range of innovative digital laminating machines from manual to totally automated pile feed systems. We also offer service & support as well as a full range of matching consumables including the renowned UltraBond laminating films and the latest range of foils and clear varnishing films. We are a Diamond Partner of Duplo International and offer their full range of booklet makers for both traditional and digital print production. All our booklet makers range from small desktop machines to fully automated digital and collator style feed engines offering up to 3,500 booklets per hour. A dedicated range of card creasing and perforating machines from entry level desktop manually operated through to fully automated finishing machines capable of Slitting, Cutting, Creasing and perforating in a single pass. Visit our showroom to see demonstrations of all our equipment. A wide range of dedicated digital folding solutions from Duplo, Eurofold and EasiCrease UK. From traditional buckle fold technology incorporating the latest in vacuum feed technology to the very latest from the evolving Touchline Family of Crease & Fold systems. Designers, Importers & Manufacturers of Innovative Digital Print Finishing Machinery Since 2005. The home of printing consumables and new and used perfect binding machines, card creasing machines, commercial laminating machines and much more! The Finishing Point Ltd is a family business built on trusted family values and established in 2005. We are proud to be a family business and have built our success on honesty, reliability and trust. Many of our customers have remained loyal to us for more than a decade, trusting us as individuals and as a business. Should you choose The Finishing Point to assist you in your business, we will assure you of our commitment to providing you with a high-quality service, always at the best price. In line with our commitment to doing so, we always welcome feedback on our pricing and service so that we can further improve our customer care. Our machinery expertise and our large consumable stock can help your company to achieve its full potential. Further to this, through our dedicated technical assistance and nationwide service team, we can offer you tailor-made service agreements which help to keep your business achieving maximum efficiency. Working in partnership with world leading manufacturers such as Duplo International, Ideal &, GMP as well as our investment into our own manufacturing facilities in China, we are dedicated to the supply of innovative technology and equipment for the Digital Print Finishing Industry. Our GEMINI brand which has been designed and manufactured exclusively for The Finishing Point offers the very latest technology and innovation taken directly from our years of experience in the Print Finishing Market. The Gemini range, which consists of both Electro-Mechanical and Hydraulic Paper Guillotines, Digital Compatible Perfect Binding Machines, High Speed Multi-Functional Card Cutting Machines and the Multi-Lam Digital Laminating Machines offering laminating and foiling in one package all come complete with our market leading Two Year Parts and Electronics Warranty. Since the introduction of the Gemini brand in late 2015 we have received much positive feedback with regards to the reliability, ease of operation and accuracy of our Gemini machinery with several customers returning and specifically requesting our Gemini Branded products. Binding Machines - Bind your documents in a quick and easy process! 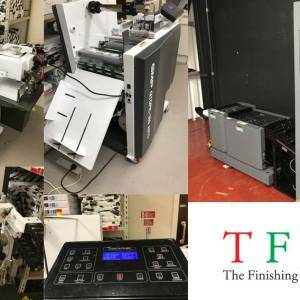 The Finishing Point confirm their attendance at The Print Show 2018!